Seamless import of V-Ray scenes into Real-Time, Ray-Traced rendering now available in Unreal Beta for Architecture, Automotive, and Design. Chaos Group has released a beta version of V-Ray for the Unreal Game Engine. By joining “real-time” and ray tracing in a single, unified pipeline, artists can now simplify and bring V-Ray scenes directly into the Unreal workflow, allowing for faster and easier creation of immersive experiences. The rise of immersive visualization and configurators in industrial and professionals settings is leading to a unification and merging of two previously distinct 3D pipelines—real-time game engines and offline ray tracing rendering. Architects, product designers, and related professionals are using virtual production and VR to present and host design reviews. In the past, bridging the VR workflow with the designer’s offline ray tracing workflow meant users familiar with 3dx Max and SketchUp had to recreate their key design choices like lighting and materials in Unreal. Now with V-Ray for Unreal (beta), artists and designers can transfer the entirety of their scene directly into the real-time environment. V-Ray for Unreal is designed to be simple, acting as a natural extension of the visualization workflow. Using the V-Ray for Unreal importer, artists can bring every part of their V-Ray scene file into the game engine, automatically converting lights and materials into their real-time equivalents. 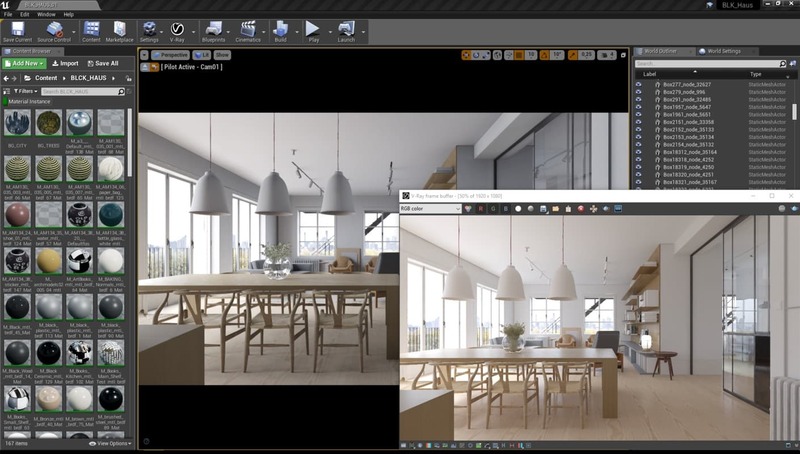 V-Ray for Unreal also maintains a smart connection to the original V-Ray materials to ensure the highest fidelity renders. At render time, V-Ray leverages the combined power of GPUs and CPUs for ultrafast ray tracing. V-Ray for Unreal can also be applied to CAD workflows, bringing the power of V-Ray to new users. As geometry is imported from programs like Solidworks, designers will be able to apply V-Ray lighting and materials to their assets, preparing them for a photorealistic result. The V-Ray for Unreal beta is open to all artists and designers. Sign up now.